Titan prides itself in offering you a wide range of new home floor plans from industry leading manufacturers. 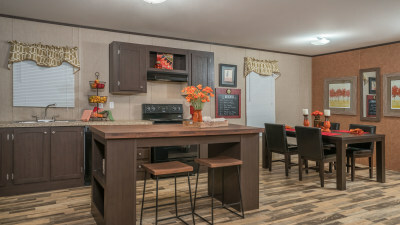 With such a wide selection of mobile homes for sale, you can choose from single-wide mobile homes, double-wide mobile homes, triple-wide mobile homes, modular homes, and even our new tiny home park model RVs. Each design series offers a variety of floor plans, styles and price ranges so you are certain to find exactly what you are looking for. Our site does not offer exact pricing on our models due to the many variables when building a dream home. To get a price quote today on any model simply request more information online or call us directly. If you would like more information about our clearance homes or used mobile homes inventory, including trade-ins, foreclosures, and repos visit our Used Mobile Homes for Sale. Why wait? Get started finding your dream home today by clicking on one of the new home categories below! 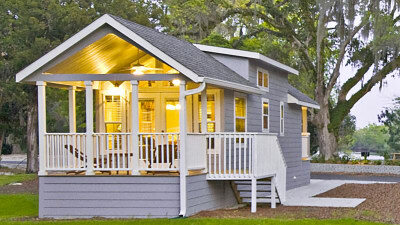 Single wide mobile homes are single section homes ranging from 400 sq ft to 1330 sqft. Single-wides offer a fast and affordable way of getting your dream home without losing quality of construction. Double wide mobile homes are 2 section homes ranging from 1100 sqft to 2400 sqft. Double-wides offer an amazing exterior appearance while keeping a open and spacious floor plan layout. 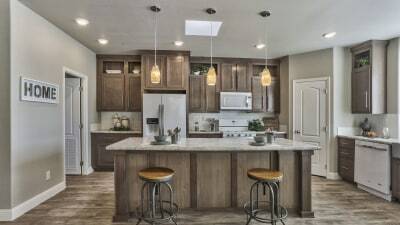 Check out our award winning kitchens! Triple-wide mobile homes are 3 section homes ranging from 1600 sqft to 3100 sqft. If you’re looking for something as big as Texas you have found it. While embracing our craftsmanship standards we are able to offer the largest manufactured homes at the best price on the market. 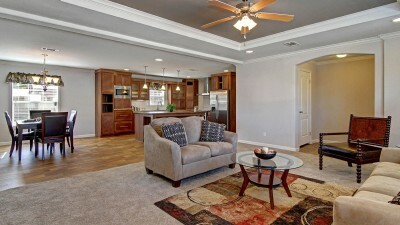 Modular homes are our same beautiful floor plans placed on a permanent foundation. Most people think modular homes, or prefab homes, are just homes that look nice. Actually, any of our multi-section home floor plans can be built as a modular home and will actually look the same. What changes is the code the home is built to and the material in the walls. 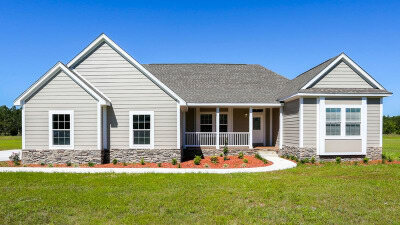 This series of manufactured homes are built with solid construction and are a great value. With a large selection of affordable mobile homes for sale, you’re sure to find a home that fits your budget. With a maximum square footage of 399 sq. 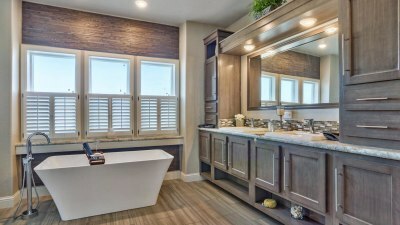 ft., Park Model homes are designed with space efficiency in mind. Custom tray ceilings, tower dormers and even a spacious loft are available. All you need is just one look at this series of homes to understand why we are "innovators in recreational living." 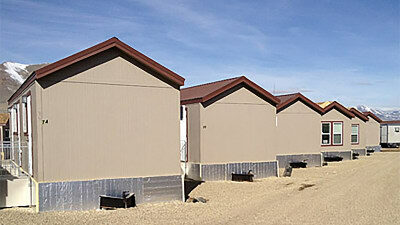 Titan offers a full line of oil field housing and man camp housing with turn key construction. If you're a large company wanting a full man camp, or an investor wanting a couple of units, we can help with a range of multi-room oilfield units. The Pine Mountain Cabin series is designed for the outdoor enthusiast who wants a quality rustic product for hunting lodges, a home on the lake or just a private getaway. 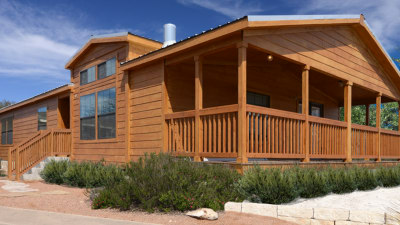 Pine features can be found throughout the exterior and interior of these cabin-inspired homes. Where do you start? Learn about the purchasing process involved in any manufactured homes for sale and what your next steps will be. From meeting your housing professional to moving in - Titan has you covered.